I had all sorts of plans to cook all sorts of exciting this last month. I had a week’s holiday and everything so I thought I might actually get lots made that week – maybe even do some baking! 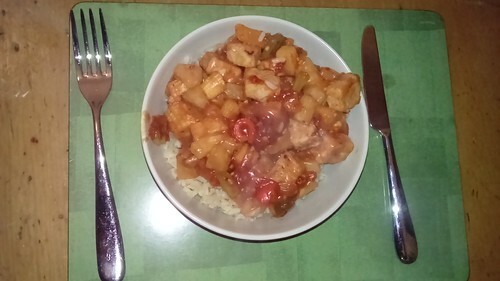 The month started well, with some Sweet and Sour Chicken (Quorn again, I did intend to make it with tofu, but there was all this quorn in the freezer needing used up), which, despite a minor disaster, was pretty good. 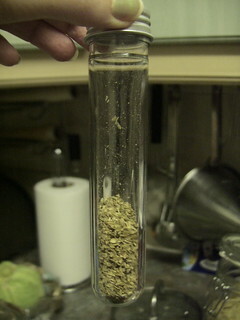 The minor disaster was that it suggested using dried chilli flakes. I normally measure them out before adding them to anything – my tongue is notoriously timid with chilli – but I always end up putting too little in whatever I’m cooking. (I’m better at judging chilli powder, but chilli flakes are what I have in the cupboard.) So, in my wisdom, I decided to shake some into the pan, and you can guess what happened next can’t you? I didn’t quite end up with half a jar in the pan, but there were decidedly more than were necessary to the recipe. It could all have been much worse but that was definitely the spiciest sweet and sour chicken I’ve ever eaten. I had two other recipes picked out to make this month, good, solid, winter warmers. Perfect bulk cooks to nourish me through the long winter nights. I even bought vegetables for them. Did I make them? No. I did in fact get to the very last day of November without having cooked anything else from the book. I was really starting to think I was going to fail out for this month. 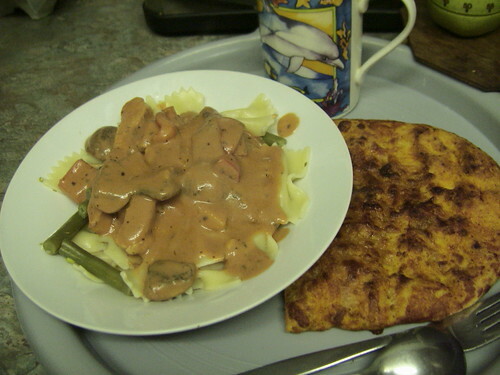 Handily though, I remembered that there was a recipe for a Porcini, shitake and Oyster Mushroom Pasta in the book and that I had loads of mushrooms that I’d bought for one of the recipes I hadn’t made. 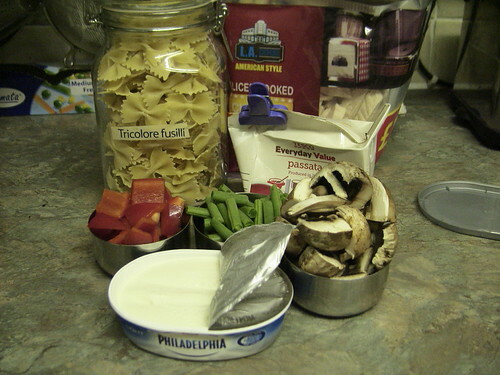 (As the recipe name suggests, it requires several kinds of mushrooms, handily I had some more unusual mushrooms in dried form in the cupboard to balance out the masses of Chestnut mushrooms.) I cut down the recipe from its original version, as I always end up with far too much food. There was still a slight excess of mushrooms, but only really enough that I ended up with a small side of mushrooms for another recipe later in the week, rather than an excess of them. An odd side effect of cutting down the recipe was that I ended up with lots of excess vegetable stock – its really awkward to make a small amount of stock out of stock cubes – so I cooked my spaghetti in the leftover stock and it was incredibly tasty. I could have eaten the spaghetti plain, maybe with a little parmesan but perfect just as it was. 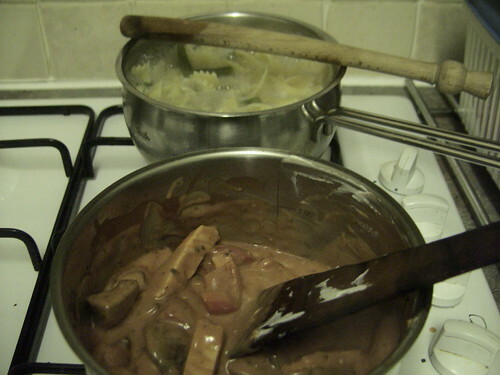 I’m not sure if it was the intention of the recipe or a product of cutting it down, but the mushroom liquor didn’t cook down as much as I expected – I think if I make it again, I would add some corn flour to thicken up the sauce, I do prefer a bit of body to my sauce.